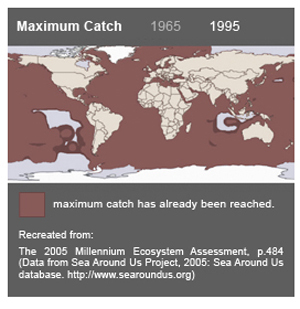 All regions of the oceans are affected by humans to varying degrees. In 2008, a study published in Science actually quantified and mapped out the human impact on the world's oceans. 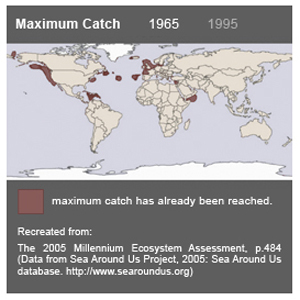 They included data on fishing, invasive species, pollution, climate change and more. Their analysis revealed one region that's been least affected: the Ross Sea, Antarctica. The recently released Millennium Ecosystem Assessment, which amassed information from 1,300 researchers in 95 countries, reports that of all human activities, overfishing has the most widespread and dominant direct impact on food provisioning services, which will affect future generations. Humans first exploited fish that were close to shore in shallow waters. But over time, we've had to travel further away, moving into ever deeper waters to find more fish. Despite these increases in effort, overall global fish landings have been in decline since the 1980s. Recent United Nations Food and Agriculture Organization statistics show that 80 percent of global fisheries are fully exploited, overfished, or collapsed. Another 18 percent are moderately exploited, with only two percent left for development. We've run out of places to fish. We have the opportunity to learn from the past. By stopping further fishing in the Ross Sea we can preserve the last intact marine ecosystem on Earth. Halpern et al (2008) A global map of human impact on marine ecosystems. Science 319: 948–51. Millennium Ecosystem Assessment (2005) Ecosystems and human well-being: Current state and trends, Volume 1. Island Press. Food and Agriculture Organization of the United Nations (2009) The State of the World Fisheries and Aquaculture – 2008. FAO Fisheries and Aquaculture Department. The two graphs show the areas that had reached their maximum potential in 1965 and then 1995.